Franciacorta, designating the land between Brescia and Lake Iseo, appeared for the first time in 1277 (in reference to the curtes francae, a tax- and duty-free trade area) and it is one of northern Italy’s leading area for sophisticated, dry sparkling wines made by Traditional (Champenoise) method, austerely elegant sparklers with a fine, creamy mousse of bubbles. Roughly square in shape, the Franciacorta region stretches eastwards for 15 miles from the Oglio river, which flows out from the lake, to the Mella river and the western suburbs of Brescia. The morainic origin of this area gives the soil an extraordinarily rich mineral content that, together with the variety of its components, determines the key factors for a high-quality viticulture, which can be fully appreciated in the sensorial characteristics of every Franciacorta. Historically, a fairly bucolic place, and home to many convents and monasteries, Franciacorta became Italy’s premier sparkling wine area in the 1970s titled with the DOC quality certification and afterwards promoted to the ultimate level of DOCG in 1995. This is a unique place for wine production. Since the Middle Ages, the name Franciacorta has been describing a territory, favoured by its location and climate. Here accuracy and creativity combine to create a unique wine-making method known by the name of Franciacorta itself. Imagination and scientific strictness have been coexisting within the local culture, adding originality to something so ancient. In this prestigious area, we discover Azienda Agricola Santa Lucia, a little paradise where nature and architecture mix with balance, along with the tradition of Franciacorta territory. Time seems to stand still in the vineyards facing the sun and making the Erbusco hills so pleasant. Here the production takes place in the architectural complex around Longhi Palace. The palace was built in the 17th century on an existing building structure dating back to the 14th century. This pleasant feeling is renewed when visiting the wine cellar, where wine is made with great passion. 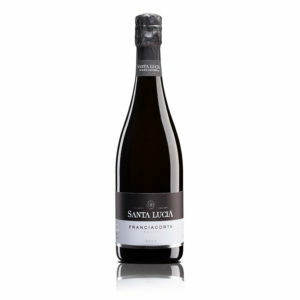 Flagship of Santa Lucia are the vineyards, stretching along Erbusco (heart of the vineyard region) Rodengo Saiano, Capriolo, Passirano and Rovato for a total of 30 hectares and including some “jewel vineyards”. These vineyards are among the few exclusive Franciacorta vineyards. The flourishing nature shows its richness through fine aromas and elegant results, thanks to the help of its terroir and a particularly favourable microclimate. Santa Lucia, since the late 90s, is the result of combining the experience in the research field and wine industry consulting. This is what Pierluigi Villa, his wife Ardenia and their sons Gregorio and Maurizio, have been and keep on doing. If you gave the mountain wine, you would see it dance inebriated; Flawed is the one who finds flaws in Wine. Never will I regret drinking wine Which is what perfectly educates the man. Santa Lucia is conducted according to the Organic farming method and 2014 was the first certified harvest. Organic management ensures respect for the environment and promotes the expression of the synergies already present in nature, respecting its slow times and best choices. This leads to the production of elegant, balanced wines, to share with friends and rediscover the bond with the earth that Vine&Cork helps to bring on your table. Each label stands out in style and elegance, leaving at each time a different emotion.